A frightening amount of money will be spent on celebrity endorsements for Super Bowl LIII. But not one dollar will come from Kia. 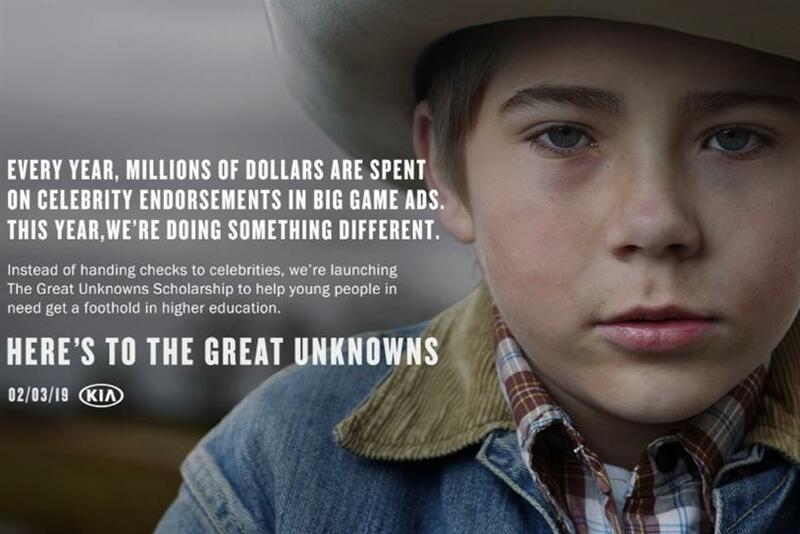 The auto brand is embracing the path less traveled for its tenth consecutive Super Bowl appearance by launching "The Great Unknowns Scholarship" to help young people in need get a foothold in higher education. "We are living in a world where people are enamored with celebrities and fame," said David Angelo, chairman and founder of David&Goliath, Kia’s agency of record. "When it comes to the Super Bowl it’s no different. This year we’re doing something that goes beyond that. Rather than focusing on celebrity endorsements, we are honoring the unfamous, the hard working people behind the scenes who give it their all on a daily basis. We call them The Great Unknowns. Stay tuned." The brand released a 30-second teaser ad during the NFC Championship game this weekend. Full details will be revealed on February 3.